For the third time, trade show organiser UBM is providing a platform for forward-looking industry startups. During Hi Europe & Ni, the Startup Innovation Challenge enables newcomers to present their solutions to a professional audience. For the third time, trade show organiser UBM is providing a platform for forward-looking industry startups. During Hi Europe & Ni, the Startup Innovation Challenge enables newcomers to present their solutions to a professional audience. If they win, they will receive comprehensive expert coaching and marketing support. This year’s 13 shortlisted companies have now been announced. 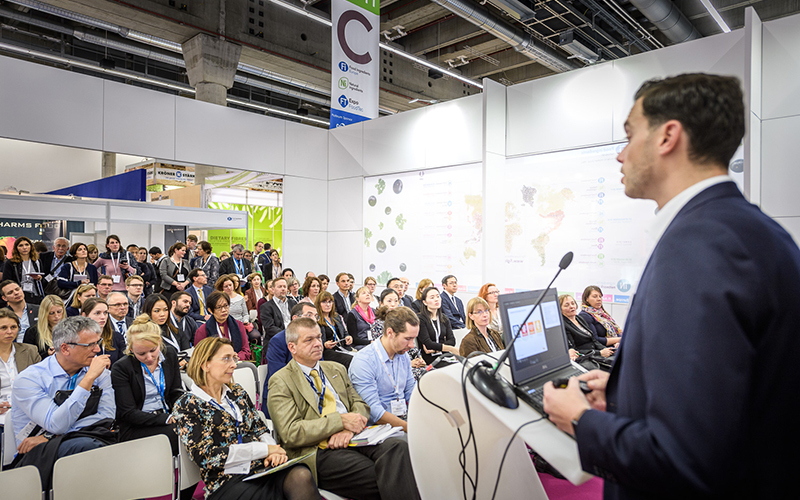 The companies will pitch live between 15.45 and 17.30 on Tuesday 27 November 2018, the first day of the show, at the Industry Insights Theatre. The winners of the three categories will receive their awards following the live pitches. FunGeneX/The Netherlands has developed a technology to produce egg white proteins based on sugar from sugar beet. These products fulfill the need for binding proteins that are neutral in colour, taste and smell for vegan applications, while contributing to reduced global warming and animal suffering. GNUBiotics/Switzerland is a biotech startup active in R&D to reproduce the diversity and complexity of unique structures found in mothers’ milk. It is developing a novel platform for selective microbiota modulation via next generation Human Milk Oligosaccharides (HMOs) using up to 130 Microbiota Accessible Carbohydrates (MACs) structures. Magellan Life Sciences/UK is a synthetic biology company creating novel platforms to produce plant-inspired molecules, such as a natural non-caloric protein sweetener called Brazzein that is inspired by the West African fruit Oubli. Renewal Mill/USA is upcycling by-products from food manufacturing into high-quality ingredients and finished products. The pilot project is using okara, the soybean pulp generated during soymilk production to create an organic, non-GMO, low-carb flour. Planetarians/USA makes high protein ingredients from upcycled by-products using patent-pending technology. They add value to overlooked ingredients such as defatted seeds by converting them into a high-protein, high-fibre ingredient, allowing manufacturers to fortify foods. The company’s first product is sunflower chips with more protein and fibre, and less fat than typical potato chips. Green Banana Food/The Netherlands produces foodstuffs and ingredients from the native cooking green banana, such as a flour that can be used to create high nutrient, low carb, gluten free & high dietary fibre food solutions such as Gabanna pasta. Jet-Eat Printed Food/Israel is currently developing an animal-free meat with the same appearance, texture, flavour and cooking properties of animal meat, from natural, sustainable and healthy ingredients. Based on 3D printing technology, the company creates meat products with 95 % less environmental impact compared to beef, with zero cholesterol and a lower cost. Shileo/Germany is an online food start-up that sells konjac rice and pasta meals. These low-cal and low-carb alternatives to normal pasta and rice are suitable for vegans, high in soluble fibre and can help with weight loss. Ambrosus/Switzerland is a blockchain-powered Internet of Things network for food and pharmaceutical enterprises, enabling secure and frictionless dialogue between sensors, ledgers and databases to optimise supply-chain visibility and quality assurance. Aryballe/France develops and manufactures bio-inspired odour sensors which detect and identify odours in less than 15 seconds, allowing the food industry to quickly assess the olfactive qualities of materials. Better Juice/Israel has created a solution for reducing natural sugars in fruit juices. The patent-pending technology harnesses the activity of non-GMO microorganisms to bio-convert sugars to dietary fibres and non-digestible natural molecules. Embion/Switzerland produces new prebiotic solutions for human, animal and soil microbiome nutrition from agricultural and food processing side-streams. A novel processing technology targets and extracts natural prebiotic ingredients from biomass with lower production costs, higher yield and processing speed than usual. Nucaps/Spain developed a new nanoencapsulation technology for nutraceutical, cosmetic and pharmaceutical uses. This encapsulation process, designed for oral delivery and controlled release of bioactives and microorganisms, is based on the use of food proteins such as casein, zein or soya. The three winners will get individual advice from one of the judges. In addition, the successful nominees can choose from various special prizes – from a fully equipped stand at Hi Europe or Fi Europe; a marketing campaign within the Ingredients Network; access to the “Conciergerie” innovation platform from Presans; or intensive consultation with Wageningen University & Research. In addition, one startup will be selected by Naturex Ingenium as their special prize winner. This startup will win €10,000 plus a three month business mentorship with the Naturex Ingenium Open Innovation team.